For Heaven’s Sake–and Ours–STOP GLOBAL WARMING! Joelle "mails" a postcard to her Senator. Yesterday was the Earth Day Climate Rally in honor of the 40th Anniversary of Earth Day. I worked with the Greater Washington Interfaith Power and Light to organize a multi-faith contingency at the rally, bringing together six different faith traditions to celebrate Earth and to cry out together for the need for climate change action. It was great to hear the dialogue between different congregations and faiths about climate change, how we can be more involved as people of faith, and what’s working/not working for congregations. I’m inspired to see congregations work together toward real climate solutions. 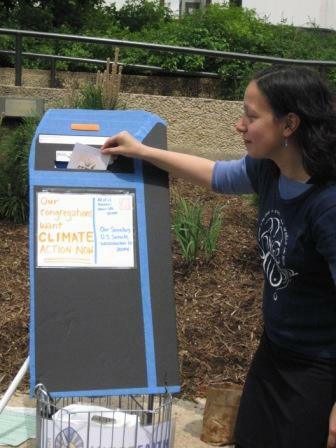 I was really glad we’d brought postcards and address labels for people to write “and mail” messages to the Senators right at the rally, so that our faith community could send a clear message that climate change is a priority to us and that we want to see legislative action now. 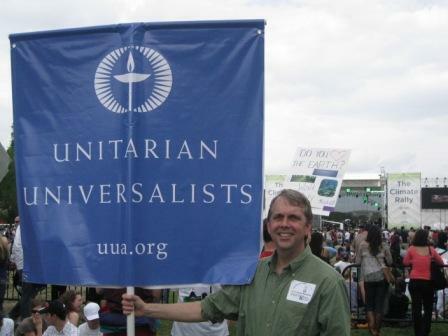 The UUA banner attracted people from near and far! UUs from at least 10 different congregations came by, from as far away as Portland, Oregon and Littleton, Massachusetts, and from several of the more local congregations in the District, Maryland, and Virginia. Several more folks came by our banner, saying that they had grown up UU and recently moved to the area and were wondering about how to get involved. People seemed to appreciate us being there, showing that as Unitarian Universalists, we are called to care for our planet and get legislation passed that makes Earth more livable for all people, both now and into the future. So all-in-all, we had a good presence at the rally and I’d like to thank everyone who came out for it! I was frustrated to hear that the Kerry-Lieberman-Graham bill, scheduled to be unveiled today, has been postponed indefinitely. Senator Graham announced that he will abandon climate legislation if it isn’t moved ahead of immigration on the Senate calendar. I am particularly concerned that according to a Washington Post article, Senators aren’t hearing that climate change legislation is a priority for their constituents. Let us make sure they know that climate change is not only a priority for Unitarian Universalists, but it is a moral and ethical imperative that action is taken on climate change. We are polluting the very planet that sustains us and allows us to live, and the first people to experience the impacts are often the poor and people of color. Farmers, for example, rely directly on the weather and the earth for growing their crops, and a changing climate impacts their livelihood. While the changes we can make in our own lives are important, legislation must be passed to enable the institutional changes necessary to tackle climate change. Please call your Senators NOW and tell them we need strong and just climate legislation now! As congregations have been registering their Earth Day events, I have become totally inspired by the great work Unitarian Universalists are doing right now! Plans for lifting up and celebrating Ethical Eating this Earth Day are underway in at least 14 states. The Second Unitarian Church of Omaha in Nebraska will have a booth at a community Earth Day event, giving away shopping and gardening tips, seed packets with church info on them, and are selling fair trade coffee and teas. The UU Congregation at Rock Tavern in New York will clean up trash in local wetlands, including a portion which flows through one of the few remaining dairy farms in the region which produces and sells milk locally. The Accotink UU Church in Virginia will follow their Earth Day Service with tastings from the “Cooking—All Things Considered” class and plan to kick off the 40/40/40 Campaign, getting 40 members to commit to an Ethical Eating action for 40 days in honor of the 40th anniversary of Earth Day. See a list of events planned (PDF), as of March 30th. Information and suggestions on issues ranging from the field to the table, with links to congregational stories, worship materials, ideas for actions in your own community are available on the UUMFE Earth Day website. Go a step further by participating in the 40/40/40 Campaign, and get 40 people from your congregation (or 40%) to commit to take action. 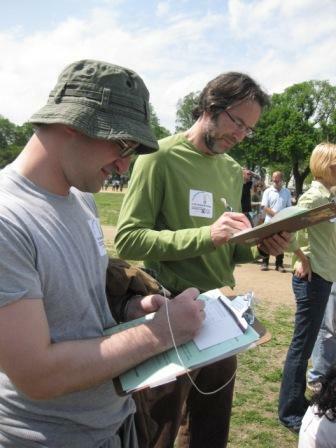 Register your Earth Day event to be included in a national press release and the final count of participating UU congregations, and check out resources on media and messaging to share your message beyond church walls. If you register your congregation’s event, you will be entered in a raffle to win a $50 gift certificate to the UUA Bookstore. Share the story of your event afterward to be entered a second time! Here are a number of activities you can do in a smaller group worship setting, whether it’s an RE class, a covenant group, a circle worship, or for a group meeting specifically for the event. Feel free to pick and choose from these resources. Select some quotes related to ethical eating. Pick quotes from a variety of sources, such as Wendell Berry, Michael Pollan, the Bible, and Thich Nhat Hanh. Have people select a quote that appeals to them. Go around the circle and have people read the quotes aloud and share their reactions to the quotes. Lead a ritual to wash away the things that are preventing us for eating more ethically. Have each person silently think of something that is blocking them from focusing on their faith or from making mindful decisions around food. Have them write it on a dish with a washable marker. 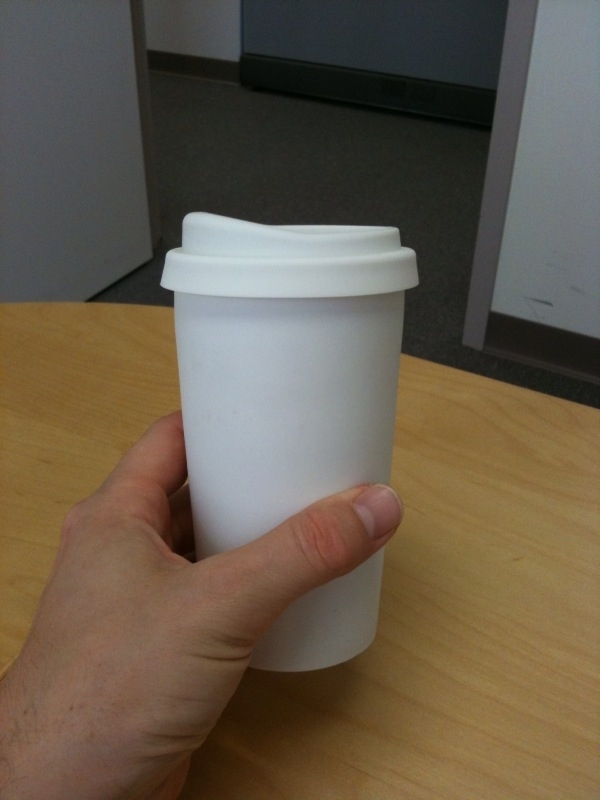 Provide a pitcher and bowl for people to silently wash away these barriers to action. Lead a guided meditation on tangerines (or some other food). Thich Nhat Hanh has a short essay on this in his book, Peace in Every Step, which discusses this more. Have people think about the origins of the fruit and all the people and natural resources involved in getting the tangerine to them. Engage each of the senses in the fruit, one at a time. Finish each bite before starting the next. Truly focus on the fruit and be aware of the gift it is to us. Have people write down what they ate in a recent meal. Pose questions for people to think about, as they reflect on that meal. Ask them to take notes, and to especially note questions to which they don’t know the answers. Some examples of questions might be: Where did the food come from? Were pesticides and fertilizers used in the production of the foods? Were the workers paid fair wages? How far away did it come from? Discuss the answers. How might we move forward from here? Can we turn any of the “I don’t knows” into things we are aware of? Being aware of how our food is produced reduces the chances that living beings are being exploited. Give people an opportunity to meditate and consider what they’ve learned about ethical eating and food justice. Have little containers filled with soil and seeds and let people plant seeds as they share a commitment to one change, big or small, they’d like to make in their lives, on their journey toward ethical eating. Despite the great snow in DC last week that halted just about everything else, a talk on climate change was still held in downtown DC. Of all meetings to be held amidst the record-breaking snowfall, it was appropriate that one discussing climate change would still be held. Though individual weather events are not climate, as climate changes, more extreme weather events are predicted to happen. Todd Stern, the Special Envoy on Climate Change who represented the US in UN negotiations in Copenhagen, spoke to a packed room at the Center for American Progress about what happened in Copenhagen, where we are now, and where we will go. Essentially two narratives of Copenhagen have emerged. Some people say that the COP15 was a failure, as they didn’t accomplish what they set out to do within the UN process. No fair, ambitious, and binding treaty was signed. Others call the climate change conference a last-minute success, as many countries agreed to the Copenhagen Accord, which is a politically–not legally–binding document. The Accord quantifies climate change with the goal of limiting change to 2 degrees Celsius. For the first time, countries agree to reduction targets, which they successfully submitted by the end of January. Countries need to “sign on” or indication an association with the Accord. Some people are concerned because this was accomplished outside of the UN process, though others applaud that something, anything, happened. The reality is that countries came into the meeting with deep gaps in their positions on climate change within the UN process, and these gaps didn’t narrow prior to the meetings in Copenhagen. There is clearly a difference in opinions about how much the developing countries should do in terms of their commitments to climate change in comparison with how much the developed countries should do. This is partly based on the weight that is given to historic contributions of greenhouse gases to the atmosphere, as the US has contribute a significant proportion of the greenhouse gases in the atmosphere today. Todd Stern made it clear that the US position is that both developing AND developed countries need to share the burden dealing with climate change. He also made it clear that it is vital for congress to pass climate change legislation this year, both because of the need for emissions reductions but also so China doesn’t dominate the emerging green economy. I think that is something that Todd Stern has right on. We need climate legislation, and we need it now. It gave me hope that that so many people turned out the meeting amidst all the snow in DC. We need to continue these conversations and move them into action. The Unitarian Universalists for Social Justice in the Greater Washington area are having a program called “After Copenhagen: How Should Our Chesapeake Region UU Community Take Action?” on March 6th. If you’re in the area, come check it out!